For a lot of us, sampling is our only means of production. It’s how we learned, it’s all we know or it’s what we enjoy. I call it the art of thievery. If you’re using samples in your music creations at some point you’re going to have to clear them or risk putting yourself in an invulnerable position. Using uncleared samples (even if it’s one) opens you up to the mercy of the sample owner. At this point, they can do whatever they want. They can pull your song, demand unfair compensation, royalties etc. Quick Note – sample clearance or clearing a music sample is a music license, the only difference is you’re licensing parts of the song rather than the entire song itself. Sampling is taking a piece of music that you do not own or have control of and using it within your own body of work (music). That’s the easiest way to explain it without using technical jargon. For a piano player this can simply mean taking a drum loop or horn line and composing over the top. For hip-hop or any other electronic producer this could mean using various instruments, voices, synths etc and looping them up. Some producers/beat makers like to take it a step further and chop the sample(s) into multiple parts this way they have more control over the sample. Sampling is sampling, no matter how you cut it, here are a few methods that are commonly used. This involves recording phrases, hits and loops from a vinyl record, album or any other audio source. Most of the time it’s going to revolve around recording from a record. Pre-made loops that are ready for use. All you have to do is import them into your project and build around them or use them to aid your current production. Some even treat them as traditional samples – chopping, tracking etc. Myth → It’s royalty free, I don’t have to get clearance. Make sure you read the fine print. A lot of times we as producers or beat makers, (I use the term loosely) find a song, hear a portion we want, and we sample it without knowing who owns it. This goes deeper than knowing the name of the song and performing artist because some songs are covers. This means the master recording could be owned by a separate entity. This entity might be an indie artist, another label or some unknown studio engineer who wasn’t paid for his services. Knowing this information up-front will help the process move along a lot smoother. If the artist is signed, the label will more than likely own the masters recording. Labels and publishers will generally have an in-house team they’ll forward you to for all licensing and sample clearance related business. If the artist isn’t signed, ask them who owns the master recording and the song. As stated in step 1, people are known for doing covers and if you’ve never heard the song, you might be inclined to think it’s an original. You want to make sure you have some basic information outlined and ready to go. What part of the song did you sample? How are you planning to use the sample? This may sound like a lot of work, but remember, you’re asking someone if you can tamper with their creation so it pays to be thorough. Contact the rightful owners of the work, let them know what you’re trying to do and send them what you’ve created. When you send music to the copyright owner (writer/publisher) make sure you send them the outline which contains all the information listed in Step 3, the original song as well as your song utilizing the sample. If you’re working with a publisher, they might not be familiar with the original song. Publishers are in the business of controlling, pushing and owning copyrights (percentages of them). When reaching out to record labels contact their licensing or business department to negotiate the master recording clearance. Sometimes they request a written letter other times they’ll have standard forms that you can download. Supply whatever you can to make the process run smoothly. Negotiating should be taken seriously. It’s not as as simple as finding a price point, agreeing, paying and then moving on. When negotiating sample clearances, you’re making life decisions. Who owns copyright of new song? How will the royalties be split (if any)? Who will own the copyright if you die? Extent of clearance (license use)? How much? (no standard rates)? How will credits be displayed? Quick note about the extent of usage. 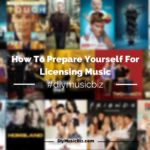 Think hard about how you want to use this license because it will have an impact on your potential revenue. Let’s say you get clearance for live performance and someone hears it and wants to use it in a video game. If you’re terms don’t cover this, then you’ll have to go back and re-negotiate. You should cover all basis in the initial negotiation. For some, clearing samples is too much work. They don’t like doing the groundwork. Luckily there are companies that will assist with the process for a fee. Two companies that will assist with sample clearances – Dmg Clearances and the Harry Fox Agency. I will add more as they pop up on my radar. Great info, I was clueless as to how to go about clearing samples, which made me hesitant to even use them, this helps alot! Is it common, or at least somewhat common to get sued or have some other action taken against u for a sample used in amixtape? Yes, it’s common. Doesn’t matter if you’re using it for a mixtape or anything else you broadcast and distribute. I’ve always wondered about the legal implications in recreating a section of pre-recorded music. In other words, working around the need to clear samples by re-creating (re-writing) the sample. How can one re-create the work so that it’s “different enough” to avoid a lawsuit? If the section of music that’s re-created doesn’t contain lyrics, I believe one is not likely to encounter legal problems. Even if the being interpolation contains no lyrics, you’d still be infringing on the copyright. If you meant re-creating in terms of creating a similar sound… that’s another story, but you can still be sued for doing that, it’s fine line. I’ll touch on how to avoid sample clearance in the near future. Hey Greg – yes, I’m talking about creating a new, similar sounding sample that sounds like the original sample. The question is how different does it need to be? I don’t think there’s a clear answer. I do know that a chord progression alone cannot be protected by copyright, but if the melody is very similar to the original, it seems more likely a court will determine that the later created work infringes upon the earlier. A lawyer could probably argue that a chord progression is a series of parallel melodies.